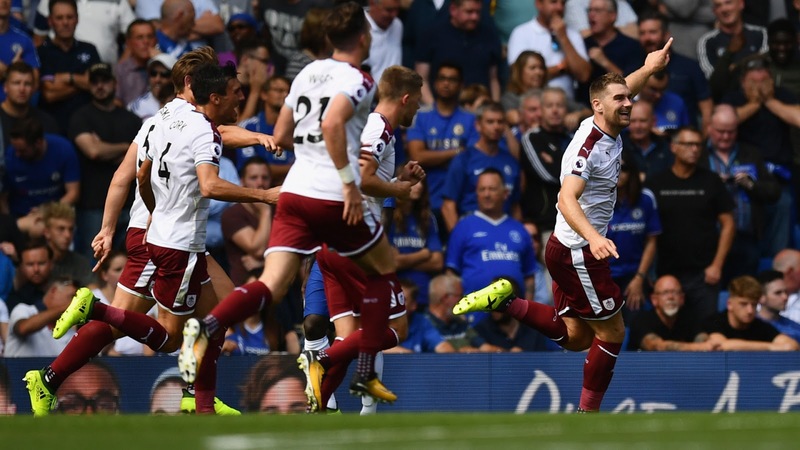 Burnley shocked nine-man Chelsea by beating the champions 3-2 in a thrilling opening Premier League encounter at Stamford Bridge. Captain Gary Cahill was shown a straight red card early on by Craig Pawson for a high tackle on Steven Defour, before Sam Vokes put Burnley ahead (24) with a neat flick inside the area. Stephen Ward doubled Burnley's lead with a fierce strike from an angle (39), and Vokes netted again before the break (43) with a free header six yards out. Substitute Alvaro Morata pulled one back for Chelsea on his debut (69), but Cesc Fabregas was shown a second yellow for a foul late on, having earlier been booked for a sarcastic clap towards Pawson. David Luiz's late goal (88) made for a nervy ending, but Burnley held on for a dramatic victory. Chelsea were reduced to 10 men after just 14 minutes as Cahill overran the ball in midfield, before going in studs up on Defour, forcing Pawson to show a straight red. There were no complaints from new skipper Cahill, but disgruntled Chelsea fans made their feelings known to Pawson before Burnley took the lead on 24 minutes through Vokes, flicking Matt Lowton's right-wing cross into the bottom far corner from 12 yards. Ward made it 2-0 with a thunderous left-footed effort from an angle after Jack Cork's deft ball into his path, and Vokes then got his second, and Burnley's third, with two minutes of the half remaining, ghosting between Luiz and Marcos Alonso to head home Defour's cross. Chelsea pushed in the second half as Alonso forced two good saves from Tom Heaton, and Morata, who had been introduced just 10 minutes earlier, headed home from close range after Willian's fine cross for 3-1. Morata then netted at the far post, but was correctly flagged offside, before Fabregas received a second yellow for a silly late foul on Cork. Nine-man Chelsea continued to push, however, and somehow halved the deficit as Luiz volleyed home Morata's flick-on inside the area. Robbie Brady hit the post from a free-kick a minute later, but after a frantic final few minutes inside Burnley's penalty area, Sean Dyche's side were delighted to hear the final whistle.